Gold slipped to a two-week low on Thursday as the dollar edged upwards despite a mixed bag of U.S. economic data ahead of next week’s U.S. Federal Reserve policy meeting. Spot gold fell as much as 1 percent to $1,309.25 an ounce and was down 0.7 percent at $1,313.43 by 1422 GMT, with U.S. gold futures down 0.8 percent at $1,316.20. That came against the backdrop of data that showed a bigger than expected drop in U.S. retail sales last month and a separate report showing that the number of Americans filing for unemployment benefits rose less than expected last week, muddying the waters on prospects for interest rates. ETF Securities analyst Martin Arnold said that Fed reluctance to increase rates provides a supportive environment for gold, but even a modest hike in December will show the Fed’s commitment and weaken gold prices in the short term. U.S. interest rate futures indicate that expectations of a an increase next week remain low, but the dollar could benefit from anything in the Fed’s statement that hints at a hike before the end of the year. Gold is highly sensitive to rising interest rates, which would lift the opportunity cost of holding non-yielding assets. The dollar, a strengthening of which makes gold more expensive for holders of other currencies, was up 0.1 percent against a basket of six major currencies as European and U.S. equities rose. 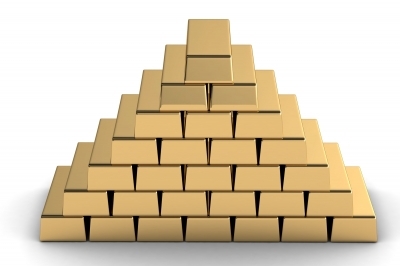 "The gold market is on the defensive. It has remained under pressure despite the clear and marked reduction in market expectations of a U.S. rate hike this month," HSBC said in a note. "The U.S. yield curve traded to its steepest in two months. The drop in yields should have supported gold more than it did, as arguably the dip in the dollar should have. This implies there is more to gold’s sluggishness." Spot gold looks neutral in a range of $1,319-$1,330 per ounce and an escape could point a direction, Reuters technical analyst Wang Tao said.